Home > Healthy Ears > How Well Do You Know Your Ears? We often take our ears for granted but each of our ears is much more than the curly flap of skin on the side of the head. Inside, this remarkable sensory organ allows us to pick up and interpret sounds from our surroundings and also helps us maintain balance. This questionnaire tests just how much you know about your ears and how they work. Q1 What is the Pinna? The pinna is the visible outer part of the ear. Most people call the pinna their ear, but the whole ear is the pinna and also the inner workings of the ear that are deep inside the skull. The pinna is also known as the auricle. It consists mainly of cartilage with skin over the top and contributes little to our sense of hearing. Q2 What are the Ossicles? Believe it or not, some of the tiniest bones in the body form part of the inner ear – and these three bones are collectively known as the ossicles. The common names for the bones in the ear are the hammer, anvil and stirrup; the corresponding medical terms are the malleus, incus and stapes. The bones get their names from their shapes. The malleus is long, like the handle of a hammer and the incus links the malleus with the stapes. This is the very smallest bone in the body. Q3 What is the Eustachian Tube? This is a narrow tube that runs from the chamber of fluid in the inner ear down to the back of the throat. It is the tube that gets blocked when you fly and your hearing seems to become very faint as the pressure in your ear is different to the pressure in the plane cabin. When your ears ‘pop’, that’s the Eustachian tube clearing again as the pressure between your inner ear and your surroundings equalises again. 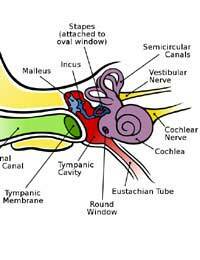 Q4 What is the Tympanic Membrane? This is another name for the ear drum. This is a stretched piece of tissue that seals the inner ear off from the outside world. It is vital to hearing, as noise and sounds create vibrations in the air that cause the ear drum to vibrate. These vibrations are passed on through the ossicles, the bones in the inner ear to the cochlea, where they are converted into electrical signals and sent to the brain. Q5 What is the Cochlea? Although it sounds more like a small creature you might find on a beach, the cochlea is one of the most important structures in the inner ear. It is the true organ of hearing and it is also the part of the ear that controls balance – and that is responsible for sea sickness, vertigo and travel sickness. Q6 Do You Have Hairy Ears? Visible hairs can grow in the ear, just inside the ear canal but these are in the pinna and not everyone does have them. If you have lovely smooth ears, however, you still have thousands of hairs in your ears. Specialised hair cells line the inside of the cochlea, moving about in the fluid to detect air vibrations. It is these hairs that sense vibrations in the fluid, which have come from vibrations in the air. They convert these signals into nerve impulses and send them to the brain to be converted into the sense of hearing. Q7 What is the Organ of Corti? The Organ of Corti is a strangely named part of the cochlea, which is the main home for all of the hairs that detect fluid vibrations. This is joined to the spiral ganglion, a set of nerves that pass through the auditory nerve to take signals to the hearing centres in the brain. Q8 How many Canals in the Ear? You may think that each ear contains only one ear canal – but this is only partly true. The ear canal is the wide tube that leads from the pinna to the ear drum but there are also three other canals, in the same part of the inner ear as the cochlea. The posterior, superior and horizontal canal look like hoop earrings, all set at angles to each other. Each one is filled with fluid and yet more tiny hair cells. These detect the position of the head in space, and tell you if you are standing upright, or lying down. They get very confused when the movement of the body doesn’t match up with what the eyes see and send signals to the stomach to get rid of its contents – in a boat on a rough sea; these little canals are what make you sick. Hi. I have had severe intense pain deep in my ear for over 3months now-Im waiting for an urgent referal appt to ENT.The pain is not helped or lessened by the painkillers I have and it also hurts on my cheek and feels like its in my bones. I have had only 2 days when my balance is unaffected and no pain free days since late April. Any advice on pain relief and what to ask/say/expect at my ENT appoinment? Thankyou.